The instructor again reviews responses and decides whether more explanation is needed before moving on to the next concept. Overall I think I am on the right track to replicating this questioning procedure in edX. You be the judge — here is what my attempts looks like on the edX website. I break the presentation of my attempt into how an instructor sets up the problem, how students see the problem, and finally how the instructor could use the results as feedback. The edX platform has a dedicated site for instructors to create course materials (called “Studio”). When an instructor wants to create a new problem, they end up at a page similar to the one below. 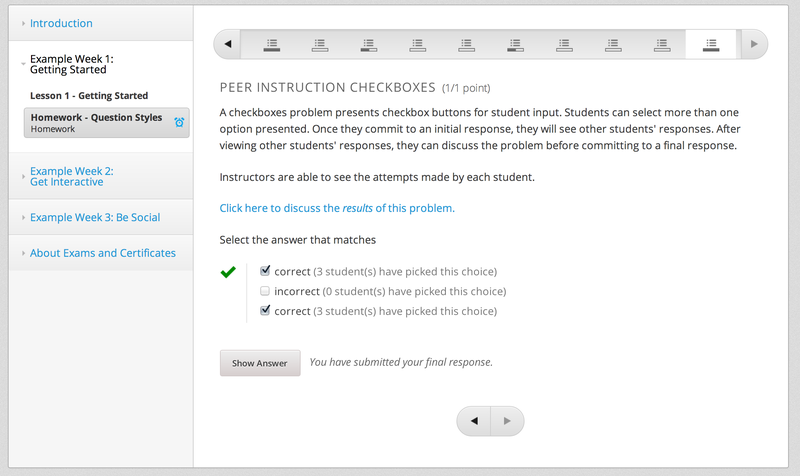 A “Peer Instruction Checkboxes” problem is an extension to the normal Checkboxes problem type. Students can select more than one option presented. But that’s pretty much where the similarities end. Here is what the initial problem looks like. 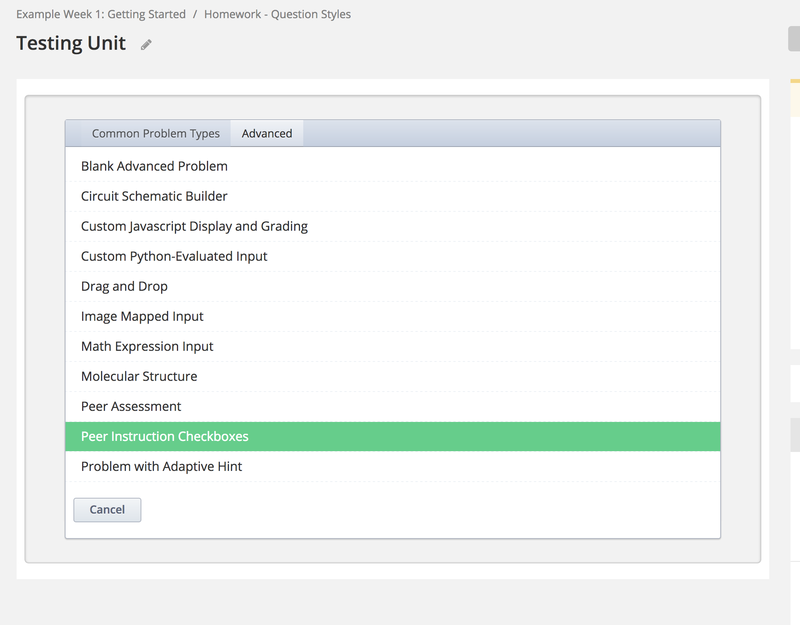 From there an instructor will, as is the usual workflow in edX, click the “Edit” button and edit the problem. 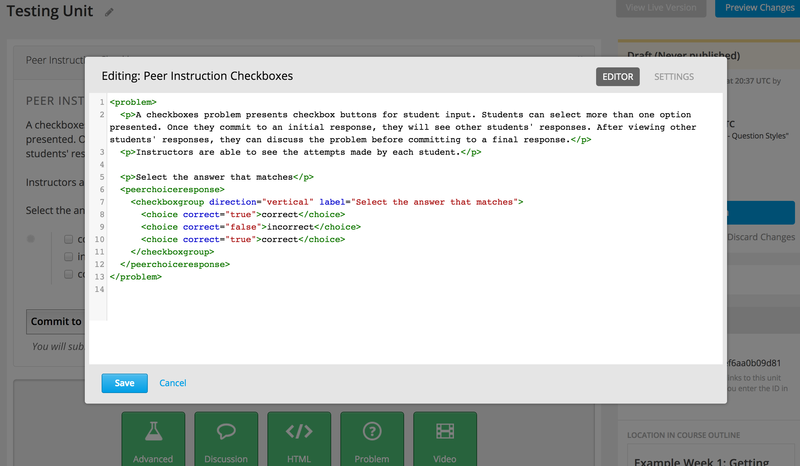 Currently the instructor has to use the advanced editor and cannot use markdown (as they can in the original Checkboxes problem type). At this point, the instructor is ready to release the problem. Now let’s take a look at what it will look from the student’s perspective. After the student attempts a response, they are presented with information about what all of the students have picked so far. A link also appears which will link them to a discussion forum about the problem. This discussion forum only opens up to them when they make an initial attempt at the problem. Also note that there is no feedback if the student was correct or not. This prevents people from making an argument based on the system telling them they were correct (so as to not stifle discussion). You might notice that a button has now appeared to the student that says “Commit to Final Response.” So what’s to stop a student from jumping the gun and circumventing discussion to go right to a final answer. I decided to reuse some of edX’s existing features to limit the minimum time between responses (shown below). Although this does not quite exactly force a student to discuss, it might be enough to get them to at least check out the discussions while they wait. I definitely think there is a lot of interesting implications for this approach, and also even just how much time to limit. For example, a class with very low synchrony might require higher delays between attempts. Once enough time has passed, (hopefully) more responses have come in and discussions have occurred so that the student may have a more informed opinion. At that point, the student is ready to commit to their final response. 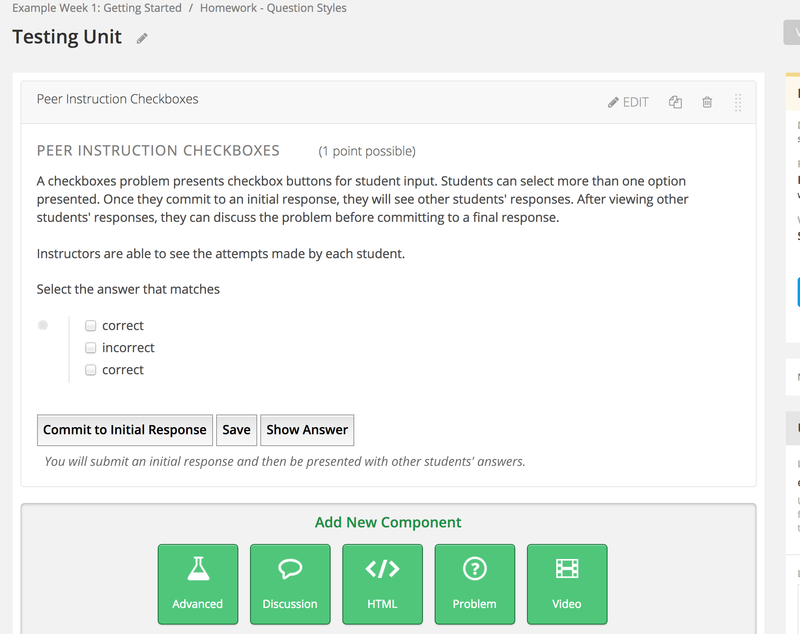 When the student commits to their final response, they will be presented with the option to view the answer as well the grade for their response. Importantly, I chose to open a new discussion forum for those who have finished the problem. They will not stifle conversation of people still “in progress” with the problem (by telling everyone the correct answer with a screenshot). But the discussion doesn’t have to end when you finish the problem. A student might disagree still with what the instructor thinks the correct answer is, for example. I think that this forum would be a nice area to voice that concern. 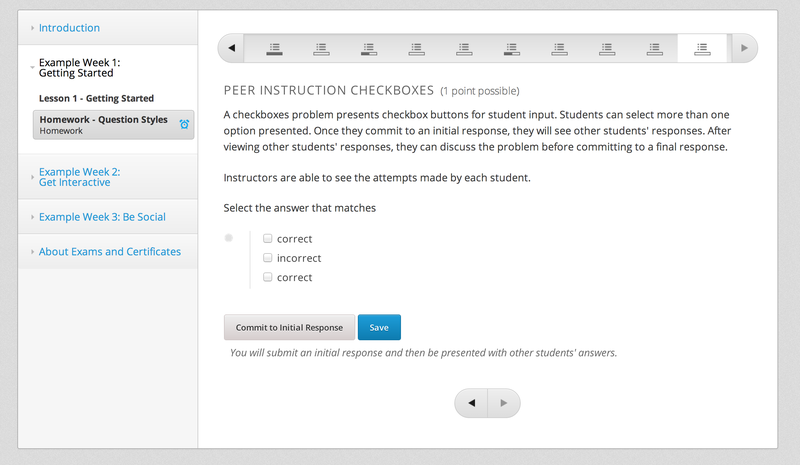 The final step of the questioning procedure in Peer Instruction is for the instructor to evaluate the responses (ideally they should also look at the first attempts too). This is technically possible through the submission history viewer, but it seems like it might be quite unwieldy to use for a large class. I am still exploring how to exactly surface this information more easily to an instructor. From a more optimistic point of view though, I think the discussion forums could be a valuable source of qualitative feedback for the instructor as it would hopefully show a student’s reasoning as they discuss with each other. The effects of synchrony on peer instruction in a MOOC: Clearly if everyone was in the same class, the questioning procedure in Peer Instruction can be done serially. However in a MOOC that may not be possible as other students may want to move on from the problem as other students are not online at the moment. Gatekeeping — when can a student submit their next attempt? 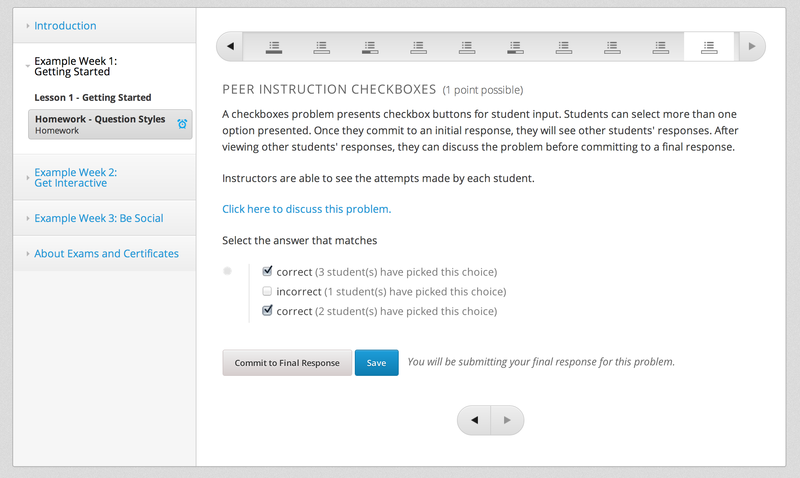 In Peer Instruction, it seems as if the instructor should review all answers before allowing another attempt. Perhaps that isn’t a necessary condition in a MOOC (and in fact, my implementation does not have that restriction). It might be useful to leave this as a setting for the instructor. I could see some gatekeeping logic to include: requirement to post on the discussion forum, look at or reply to other student’s posts, time between attempts, and instructor approval. 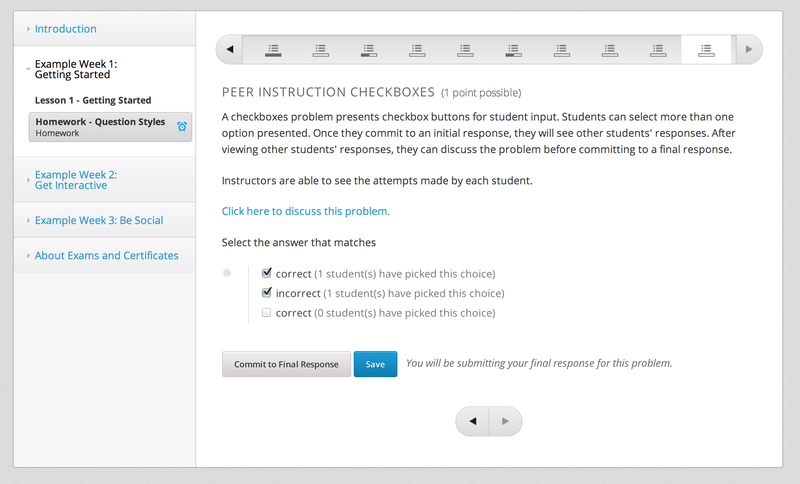 Different problem types: Ideally I would have liked a “peer instruction” version of every problem type on edX. As a first attempt, I chose checkboxes for both technical and pragmatic reasons. Anonymity in the Discussion Forums: Should students be identified? Should be something pseudorandom — that is, they can be recognized between problems, or a unique identity for every problem. I worry the latter wouldn’t truly be random as people usually have unique writing styles that could be re-identified (see my previous blog post). Number of attempts: My code easily generalizes to more than one non-final attempt (in fact it is a setting that the instructor can adjust right now). The question is: would this be useful? 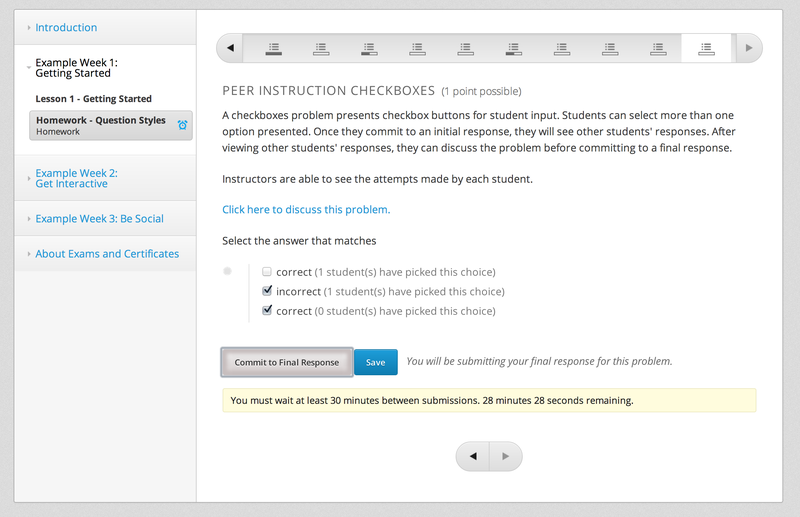 This is my work-in-progress to provide Peer Instruction for the edX platform. It was a lot of fun to hack on the edX code, but I definitely have some gripes about it (perhaps I will post about that in a separate blog post). If you’re interested in seeing the code or trying it out, reach out to me! I’ll see what I can do. This project certainly isn’t over, but I think it’s an exciting first attempt for me at bringing Peer Instruction into a MOOC. This is really fascinating! My project is about seeing what, if any, set-up and value-creation a MOOC instructor provides for the online peer forums. I made a completely random survey, and only 2 had mentioned it and/or given any kind of set-up! If peer learning / discussion is valued, then why is this instruction / value discussion not addressed? I really enjoying seeing how you’ve created this interactive piece when answering questions. But I wonder – will having students wait before submitting a question lead them to click elsewhere (perhaps off the MOOC)? This is a really interesting idea. I wonder how the students would react to both the additional interaction with other students and to the time delay on the answer even or those who feel confident about their initial response. I also find the idea of providing visualizations to the students to see how working with others influences their own work.